Bits of My Own: Harvest Blooms and the Ever-expanding Rug! I would like to thanks everyone who has taken the time to leave a comment or send me an email. I really appreciate it! I am making steady progress on Harvest Blooms. I finished the border with not much to spare! I really worked to conserve the floss. The design calls for 1 strand on 36 count I believe. I am using 2 strands on 32 count. If you ever do this design, make sure you order more floss. At first I thought the colors were a little odd, but now I am really enjoying their richness. I love how they all blend together. Rum raisin is such a good choice for the border. The brownish purple-ish color is unexpected, and perfect for autumn! I should be finishing it up in the next few days, but I will be making a few changes. I do not want to put my initials at the top, so I will add another star to the upper left, and fit my initials in along the bottom somewhere. Here is a picture of my progress so far. Furry is such a help! 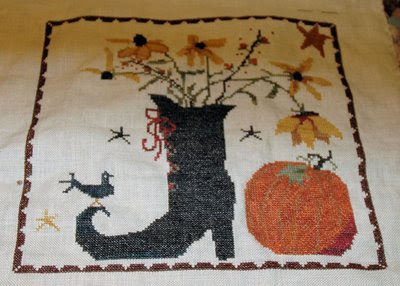 What would cross stitching be without cat hair! I am also making very slow progress on the rug. I finished off row 35. The next three rows will be dark. I have just started row 36 here. 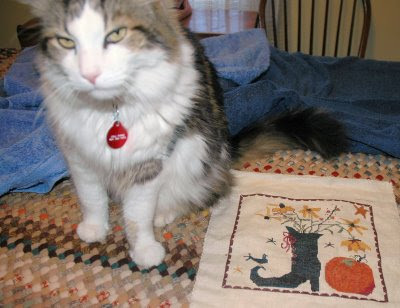 I am so impressed by your progress on your rug. Did you take any classes in rug-making or did you figure it out for yourself using a tutorial or a book? I have been cutting up my families old jeans into 2inch strips ever since I saw a rug made from old denim ... the various shades of blue was just so pretty ... I have quite a lot of it now but I doubt, once braided, it would make anything much larger than a bath mat or small kitchen rug. What is the ratio of unbraided to braided length ... I realize you'd have to divide everything by three ... but once you start braiding, how much does it reduce your starting length? I never took any classes. I guess I am just the type to jump right in, sometimes at my own peril! I have plenty of really ugly unfinished projects of all kinds! LOL! I did get several books on braiding over the years. They were all helpful, but unfortunately they vary greatly. There doesn't seem to be any one method of making these rugs. I took something from all of them, but sort of figured out my own method. I have made several small rugs over the years, but this is my first room-size rug. If I had to do it over, there are definitely things I would do differently. There have been many times along the way when I have questioned my sanity! As far as the ratio, this is one of the most difficult things! It varies enormously! 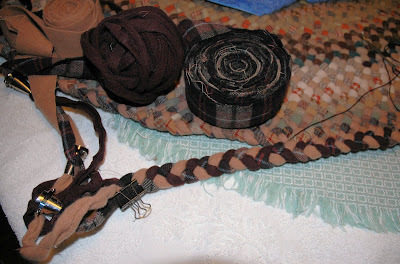 It is based on the width of the braid and the thicknesses of the fabric you are using. If one of the strands is thinner or thinner than the others, it will also change the number. The books will probably give you a formula but I would caution you on using it for more than just a rough estimate. My braids are running between 3/4 to 7/8 of an inch wide. About 12 inches of the wool are producing a braid of about 7 to 8 inches. I think the denim would be great for a braided rug. I have been collecting old jeans too, just never got around to making one. Great progress on both your pieces Erica. Love Harvest Blessings. Now I know for sure that has to go on my "to do" list. As always, love the rug.